Jeremiah Weed, the man, is something of an enigma. He keeps to himself and as of 2011, is retired, living in the hollows of the Kentucky hills from where he originally hails. The company's liquor products adhere to the long-standing whiskey making traditions stemming from the hills of eastern Tennessee and Kentucky. Jeremiah Weed's name was first put on a bottle of bourbon liquor sometime in the 1980s. The company offers variety of liquors, including Jeremiah Weed Sweet Tea Vodka in Original and Peach flavors. Jeremiah Weed Sweet Tea Vodka, Original and Peach, contains brewed tea, cane sugar and is 35 percent alcohol by volume. It is an alcoholic version of the infamous Southern style iced tea beverage, sweet tea. Drinking alcoholic beverages of any type should only be done in moderation. MayoClinic.com states that one drink of 1.5 fl. oz. for a woman and two drinks for a man are considered a moderate amount. Excessive drinking and binge drinking can lead to health problems including liver disease, heart damage and pancreatitis. One shot of 1.5 oz. of Jeremiah Weed Original Sweet Tea Vodka contains 117 calories and the same amount of Jeremiah Weed Country Peach Sweet Tea Vodka has 115 calories. Your individual daily calorie requirements depend on several factors including your gender, age and how active you are. For a typical daily diet of 2,000 calories, one shot of either Sweet Tea Vodka provides about 6 percent of your calories for the day. 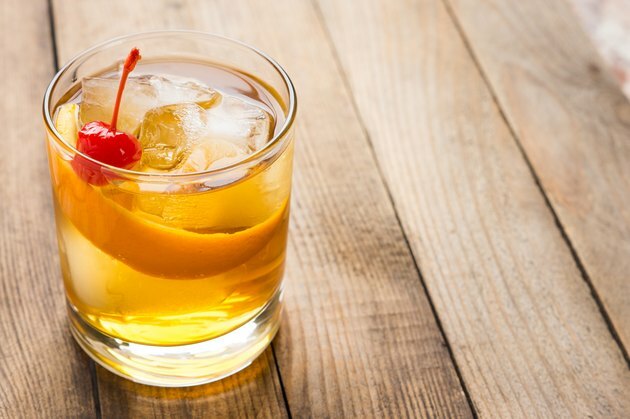 If you mix Jeremiah Weed Sweet Tea Vodka with another beverage, such as tonic or a splash of lemonade, or you have more than a shot, you must add in the additional calories for the correct nutrition values. One 1.5-oz. shot of Jeremiah Weed Original Sweet Tea has 7.7 g of carbohydrate and the same amount of Jeremiah Weed Country Peach Sweet Tea Vodka has 7.4 g of carbohydrate. The energy your body needs to function efficiently is derived from the starches and sugars of carbohydrates. MayoClinic.com recommends getting 45 to 65 percent of your calories from carbohydrates. However, the carbohydrates in alcoholic beverages are mostly derived from sugars and should not account for the main source of carbohydrates in your diet. Jeremiah Weed Original Sweet Tea Vodka and Country Peach Vodka do not contain any other nutrients, such as fat, protein or sodium. Alcoholic beverages affect your mental state and reflexes. You should never drive or operate any type of machinery after imbibing alcohol, no matter how small the amount. Don't drink alcohol if you are pregnant, nursing or have liver disease or diabetes. Check with your doctor or pharmacist to make sure alcoholic beverages don't interfere with any of your medications or supplements.